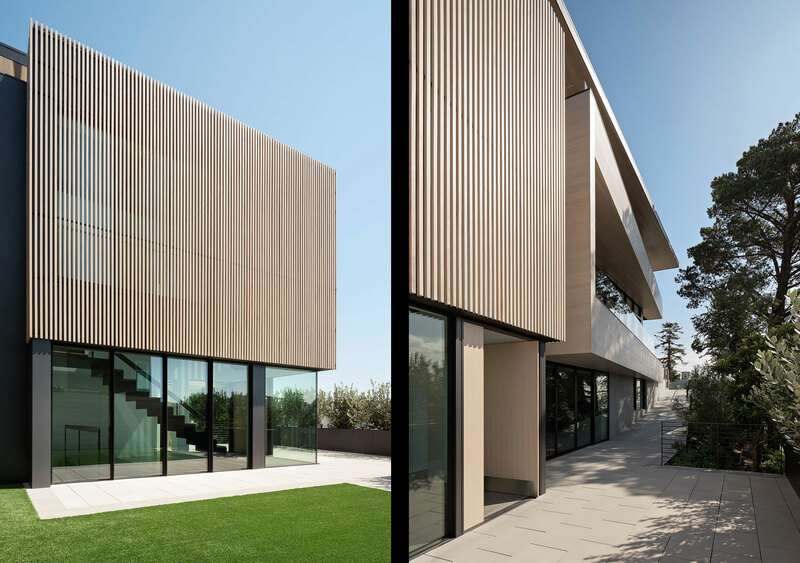 On an atypically-configured sloping double lot in San Francisco, this new home takes advantage of rare siting to maximize the experience of changing daylight and sweeping city views. The use of deep overhangs and angular cedar forms carefully frames horizon views while gently responding to the corner siting.Spaces and functions are carefully arranged to pair with varied site experiences throughout the home. A two-story glazed volume clad in cedar slats defines the entry as a bent-steel stair descends to create connection to the primary living level. An open floor plan allows flow and extension of interior spaces to exterior gathering spaces and vistas. A restrained finish palette of subtle organic materials unifies the visual language of the exterior landscape with the internal architecture of the home, creating a serenity not often found in the center of this busy city, providing a place of refuge for the growing family.